Burgundy now proudly a member of Unesco's World Heritage list. Read more on "Climats, terroirs of Burgundy" and browse the amazing scenery the region has to offer. 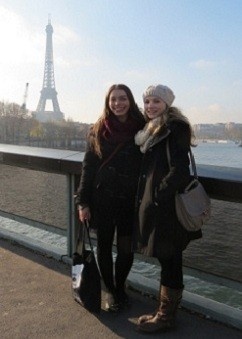 The Department of French offers an exciting study abroad program in Dijon, France. Located in the heart of historic Burgundy, just 90 minutes from Paris by train, the Centre International d'Etudes Françaises (CIEF) at the Université de Bourgogne offers a language program for students at all levels of proficiency in French. This program is open to all students and is the perfect setting to learn French or strengthen your language skills. Students may participate for the winter term or a full year. Complete information is available on our Dijon program website. The Department of French offers a three-week immersion field school program in Saint-Pierre and Miquelon, a unique and vibrant part of France that lies within Canada's territorial area. This program is open to students with an intermediate level of French (FREN 1045/1050 or equivalent). Complete information is available on our Saint-Pierre and Miquelon program website. 6 month part-time work funded by the Nova Scotia Department of Education. Organized by the French Ministry of National Education, this program is available to Canadian students between 20 and 35 years of age. Positions as an English language assistant are offered in the K-12 public school system and public language schools in one of 30 different administrative regions of France and offers students a unique first-hand experience as teachers. Your role will be to improve students' confidence in spoken English through interactive and recreational activities. Students will also expect you to introduct them to Canadian culture. Contracts run for the 7-month period of October 1 to April 30. The program is open to graduate or undergraduate students who have completed at least two full years of college or university, and who posess a minimum level of proficiency in French (B1 level). Visit the TAPIF website for further details. The application deadline for the 2018/19 program was February 18th.